When it comes to cake decorations, is there anything more decadent and glamorous than a large rose made from flower paste? Whether you are making a cake for a wedding, a birthday or a christening, flower paste roses add a sophisticated and eye-catching finishing touch. Follow our easy guide to making beautiful flower paste creations. The secret to creating a great sugar rose is to keep it light so that it doesn’t collapse. By far the best way to achieve this is to invest in some foam rose cones which are pre-made and already on a wire for easy assembly. You’ll also need a set of stainless steel petal cutters in various sizes. Along with this, make sure you have a sharp knife to hand, a plastic document holder (you’ll find out why later!) 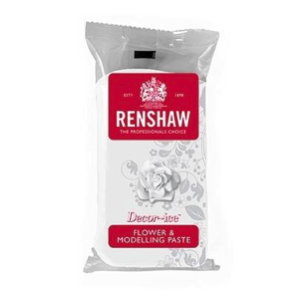 and of course a ball of flower paste – we recommend Renshaw flower and modelling paste. Choose a stainless steel petal cutter which fits comfortably around your foam cone, and roll out your flower paste to 3-4mm in thickness. Cut 6 petals out of differing sizes and lay them out inside your plastic document holder, using the other side of the folder to carefully press down on them to smooth them out. Use your thumb to gently pinch the sides of the petals, giving them a tapered edge. At this point you may find that some petals tear at the edges, so you may need a few attempts to get the technique absolutely right. Take the smallest flower paste petal and use your thumb to curl it around the foam cone. This will be the bud of the flower so wrap it around very tightly. Make sure the cone is covered so that only the very tip is on show. Repeat with the second and third petal, pinching as you go in order to allow the flower paste to adhere to itself. Build the rose up with the petals, allowing the tops of the petals to bend out at the top. You could search for a few pictures of real roses on the internet for inspiration. Finally, pinch the base of the flower paste rose carefully around the wire of the foam cone and set it aside when you are happy with the appearance. The more you practise making flower paste roses, the better you will become at it. The trick is to move slowly and carefully and don’t try to rush it. Try out various sized petal cutters and experiment with the colours and shapes as you go. All of the roses that you create can be stored at room temperature in an air-tight container for up to three months, so none of your practice attempts will go to waste! When you’ve perfected your flower paste art, try adding your creations to this brilliant vintage flower cake recipe for the ultimate way to show off your newly discovered skills! This is a collaborative post with Renshaw! Living Room Design: Ways to Recycle and Upcycle Thrifty News: Wonderthrift is the Guardian’s Sustainable Blog of the week!